Looking for a player who's still cheap and has a strong upside? LaMarcus Aldridge cards certainly meet that criteria. 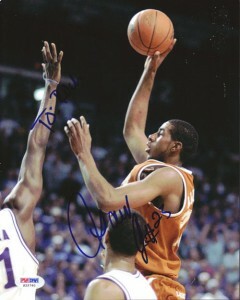 The second overall pick in the 2006 NBA Draft, Aldridge may not be an elite-level superstar yet, but he's on the cusp. Should the Trail Blazers break through, LaMarcus Aldridge cards and memorabilia could soar. And they have plenty of room to grow. Dependable for 20-plus points per game, the 6' 11" forward is Portland's captain. 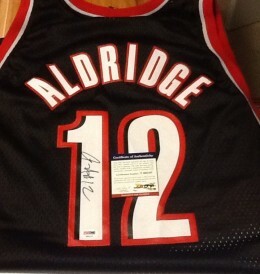 An All-Star in 2011, people are starting to recognize Aldridge's potential. With the addition of Damian Lillard, the combo could do a lot together to make the Trail Blazers contenders once again. As Lillard shows signs of brilliance, he should make those around him, including Aldridge, better. On the flip side, Aldridge should do the same for Lillard and his teammates. 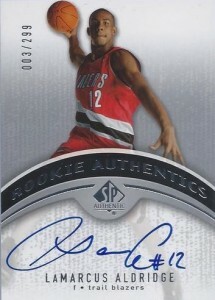 Collectors have no shortage of LaMarcus Aldridge cards when it comes to rookies. 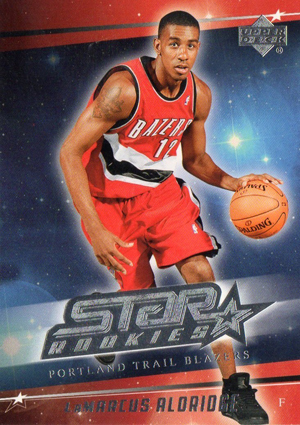 Released in 2006-07 sets, he has more than 30 official rookie cards. This is in addition to tons more inserts and parallels. Low-end rookies can easily be found for a dollar or two. Even mid-range cards are extremely affordable and could spike very easily. 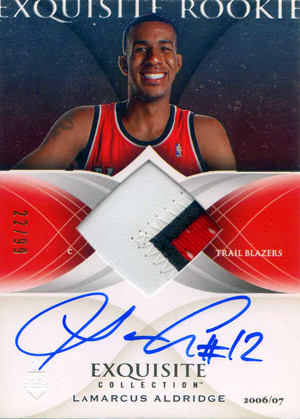 The LaMarcus Aldridge cards collectors may want to pay close attention to are the low-numbered autographs. For most, they're still relatively affordable. These are the cards that will really take off should the Trail Blazers make a post-season push. As far as LaMarcus Aldridge autographed memorabilia goes, there is some but not a lot. For the most part, certified autographs found on trading cards are the safest and most easily accessible option. 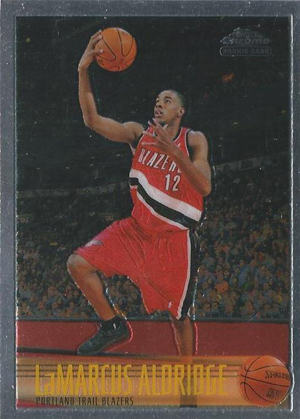 Featuring a distinctive design, on-card signature and jersey patch, this is a solid choice for being one of Aldridge's top rookie cards. It is serial numbered to 99. 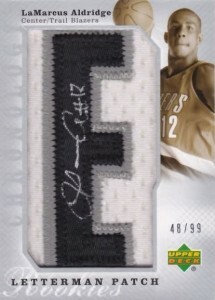 A fantastic rookie card able to pack a solid amount of content into a trading cards limited space. The jersey letter patch autograph is a highly desirable addition to any Aldridge collection. Limited to 99 total copies, the autograph is signed directly on the letter patch fabric. The simple, clean design of the SP Authentic card allows it to speak for itself. Featuring a great photograph and on-card signature, this is a must for any Aldridge collector. Serial numbered to 299 total copies allows for more people to own it compared to the other aforementioned cards and its lack of memorabilia does not in anyway detract from its desirability. 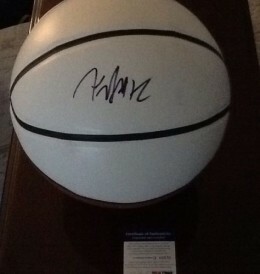 Below you will find an example of what LaMarcus Aldridge's authentic signature looks like. This can be used as a first point of reference for determining the legitimacy of autograph memorabilia, but is not a substitute for having your items authenticated by a well respected professional autograph authentication company. Reputable authentication companies include JSA, PSA, Panini Authentic, Upper Deck Authentic, Tristar and Mounted Memories to name a few. Click on any of the images below to view full size photos. The signature is very unique with few decipherable characters. The first can best be described as an large oval that flows into a sideways cursive "l."
A dash implies several letters. The letter "A" is legible and crossed. The inscription "#12" is usually present.